It’s been two and a half years since I have blogged. Some things haven’t changed: Ryan still has diabetes, he is still a champ in dealing with it all and we still experience on a daily basis the highs and lows (pun intended) of the disease. But some things have changed: we are now Dexcom Share users (for those who do not know, it helps monitor Ryan’s blood sugar by measuring the sugar in the interstitial fluid and gives us readings and trends every 5 minutes that I can see on my phone! ), we accept the fact that we can’t control as much as we once thought we could (the complexities are insurmountable at times and our best is simply our best and we try to be happy with that) and Ryan is nearly in junior high and we are entering a new world of HIS opinions regarding his care and new frustrations in the “stop ‘n go” of caring for the disease. Sometimes, in the madness of the disease mixed with the growth hormones, stress hormones and “becoming a man” hormones and adding the life-saving hormone of insulin creates a perfect storm on all levels. But we deal. Experience new things. Try new basal rates, IC ratios, correction factors and bolus extensions to continue to keep life as normal as possible and at the same time keep him healthy. And sometimes we just cut our losses and try again tomorrow. Because diabetes will still be here tomorrow. But the “too long” means that maybe doing this alone, without my wonderful d-moms and diabetes community, maybe isn’t the best idea as we hit in full stride, the tween years. And I’m finding … I still need my d-moms. I'm happily married to the love of my life and we just celebrated our 14th anniversary. I'm a stay-at-home momma to three beautiful boys, the middle of which was diagnosed with Type 1 diabetes in 2009 . . . which also makes me a full-time pancreas. I love Jesus. My passion is family and friends. My release is writing. I'm honest and real about our journey with Type 1 but try very hard to stay on the positive side of life (although not always successful), not for myself, but for my boys (all four of them). Come and read . . . follow . . . COMMENT . . . and be a part of the journey with us . . . d and non-d alike. Let's walk this road of LIFE together. 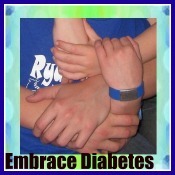 Sometimes Type 1 diabetes can be overwhelming. There are stretches of bad days and sometimes even bad weeks. And I blog about the good and the bad. But all too often, the bad is too easy to blog about and I get swallowed up in the 24/7 nature of the disease. So I decided in early May that I was going to focus one blog post a week on ONE single thing that I am thankful for, not matter how trivial or huge it may be, on Thursday, I'm choosing to find something in my life to be thankful for because of diabetes and sometimes in spite of it! The little irony I find in it all is that Ryan was diagnosed on a THURSDAY. So, join in as often as you like. Post your thankful on your facebook status, tweet your thankful in 140 characters or post about your thankful on your blog. Be sure to let me know when you do; I'd love to read your thankful too! Missy Slusser on The First Overnighter . . .
Scott K. Johnson on The First Overnighter . . .
Nicole on The First Overnighter . . .